The unlikely romance between a concert pianist and a construction worker. After a decade of touring the globe, Manhattan-based classical concert pianist Annalise Redmond needs a break. What’s a Juilliard-trained musician to do when she wants to live a “normal” life for six weeks? Weston Galloway, a former firefighter and member of an Atlanta-based construction crew, is as much into soul-winning as building the new bank in little Darling, Georgia. Anna’s barely been kissed. Weston’s not looking for love. When these two souls collide in small-town Americana, is their time together destined only to be a precious memory or will they listen to the whispers in their hearts and dare to dream of a future together? Throw in Anna’s quirky sister and brother-in-law, Weston’s challenging coworker, spirited employees at The Darling Diner, and a cast of lively townsfolk, and you won’t want to miss this journey to Darling! Whisper to My Heart. 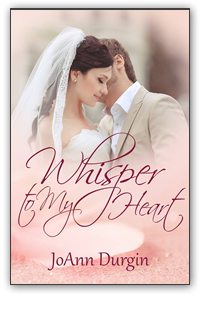 A contemporary Christian romance celebrating love, faith, community, and family.